Go faster with NativeScript to deliver cross-platform native apps. 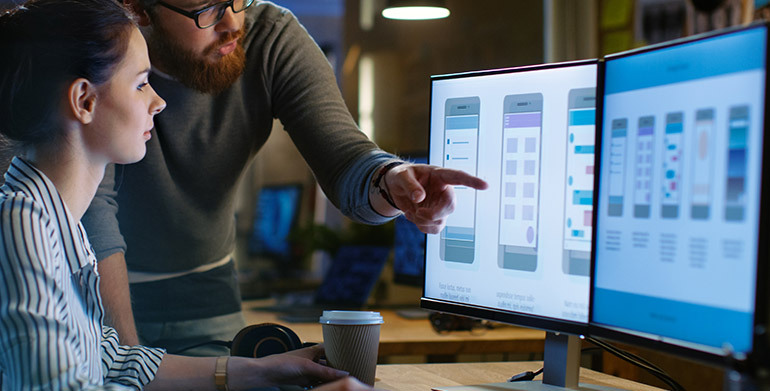 Demand for excellent, optimized enterprise mobile and web experiences keeps the pressure on development teams to produce more apps faster every day, while for the business there’s only so much developer talent to go around. Many low-code platforms can result in apps with poor user experiences, and no-code solutions for “citizen developers” generate apps of very limited use. Deliver native augmented reality (AR) experiences with open source plugins. Thanks to the combination of NativeScript and Angular's platform-agnostic architecture, now you can share your code between Android, iOS and web. Only truly native applications deliver truly native performance. Use a pure native solution like NativeScript for blazing fast performance—no hacks or HTML. New developers will appreciate the familiar syntaxes and concepts. Expert developers will find it easy to interact with the native subsystems of iOS and Android. Object Oriented fans can use TypeScript. You can also use Angular for the application architecture. Deliver native experiences on wearables with open source plugins. Deliver UIs across a variety of watch shapes. Go faster on a modern serverless platform that delivers at consumer scale. Go faster with enterprise data management capabilities engineered for modern apps. Kinvey mitigates security and privacy risks by isolating and protecting enterprise data and networks from client apps running on untrusted devices and networks. AI-powered self-service chatbot for modern apps. A high productivity tool for professional developers to build web, mobile and chat applications backed with Kinvey. Need help developing your application? Our global network of exceptional partners are experienced in a wide range of applications across industries and enterprise systems.